Retirement is when you do all the things you promised yourself! Like astonishing your grandchildren with a Beatles medley! 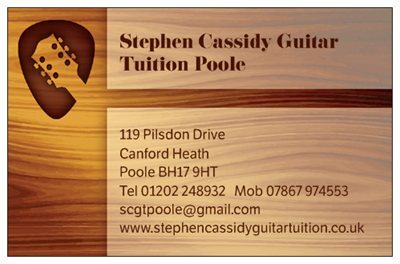 Tutor Steve Cassidy is experienced, patient and has many happy mature students learning this fascinating instrument in Poole and Bournemouth from scratch. Acoustic, electric, rock, folk, blues, reggae, metal � what do you want to learn? Why not do what you always wanted, now you�ve got the time? 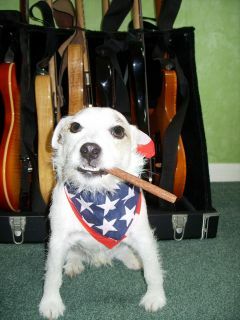 My dog Barney is as friendly as me, and loves new visitors! Check out my Mission Statement below! When I began to teach guitar, I was pleasantly surprised by the number of retired people who began to approach me for lessons, most of whom had never tried to play the guitar (or bass guitar) before. Over time, I have developed an understanding of the needs of retired people. This age group remains a significant percentage of my student base. I retired from my previous career in 2003, intending to build a viable business as a full time professional guitar teacher. Obviously it took some time to attract sufficient numbers of students to become viable. I understand that those early days of retirement from a full time job can be an �anxious time,� as you �scratch around� looking for things to fill what can be a daunting number of spare hours. The question most retired people ask is, �Am I too old to learn to play the guitar?� As much as I genuinely love what I do, I will be asking you to pay me to teach you. Therefore, instead of offering my opinion on this subject, I invite you to take a look at this article by psychologist Gary Marcus in The Guardian Newspaper which concludes that mature people can indeed learn new skills (and specifically the guitar). I get immense satisfaction from what I do and have found that my retired clients make great students. It may be something that you have wanted to do for years, but have never had the time. It is therefore unlikely to be a short term �fad.� You are likely to put in more than the minimum number of hours of practice required to progress. I understand that if you do not already own a guitar, you are unlikely to want to make a financial commitment to buying one until you are sure that this is what you want to do. To this end, I am more than happy for you to use one of my own instruments for a few lessons until you make that decision. As I offer a free no obligation half hour lesson, you have absolutely nothing to lose in having a go at something that you may have wanted to do for years. 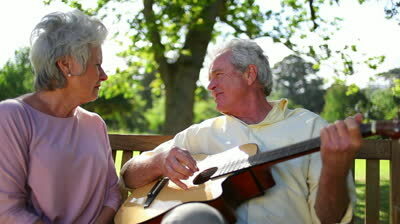 If you decide that it is for you, I offer a discount for state pensioners. I promise that you will find me to be friendly, relaxed and most importantly �very patient.� � I lost count long ago of the amount of times that my beginner students have told me how patient I am and continue to do so!